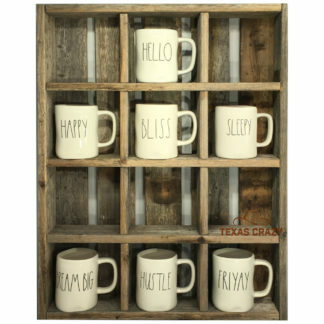 Let your imagination go Texas Crazy with these reclaimed wood cubby hole cubbies, part of our Texas Home Decor collection. These wonderful unique accents are made in Texas of enviro-friendly old weathered wood that has been recycled and repurposed for new use. Fill our cubbies with your special decorating accents and collectibles. So you can sit these rustic barnwood cubbies on a table or be mounted as wall decor. Use for collections, seasonal displays or extra storage in any room of the house. We do not include the decorator accents shown in the cubby images.